Facebook is rolling out a new option for developers in the form of subscriptions, and game companies are among the first to test this new monetization method. The feature will roll out to all developers in July, but currently subscriptions are being tested by Kixeye (with Backyard Monsters) and Zynga (with Pioneer Trail and FarmVille). Facebook noted on their developer blog: "Many developers successfully monetize their apps with one-time purchases of virtual items. Beginning in July, we are launching subscriptions as another way for you to build your businesses on Facebook. With subscriptions, you can establish a recurring revenue stream and offer updated content or premium experiences for a monthly fee." " I really hope it increases the stickiness of the game play that is going on"
GamesIndustry International spoke with Kixeye's VP of Product Marketing, John Getze, about the subscription feature. "The game we're testing on is Backyard Monsters; it's our franchise title with 20 million plus installs to date," said Getze. "It seemed like a great opportunity to provide some benefits to our most loyal players." The subscription, called the D.A.V.E. 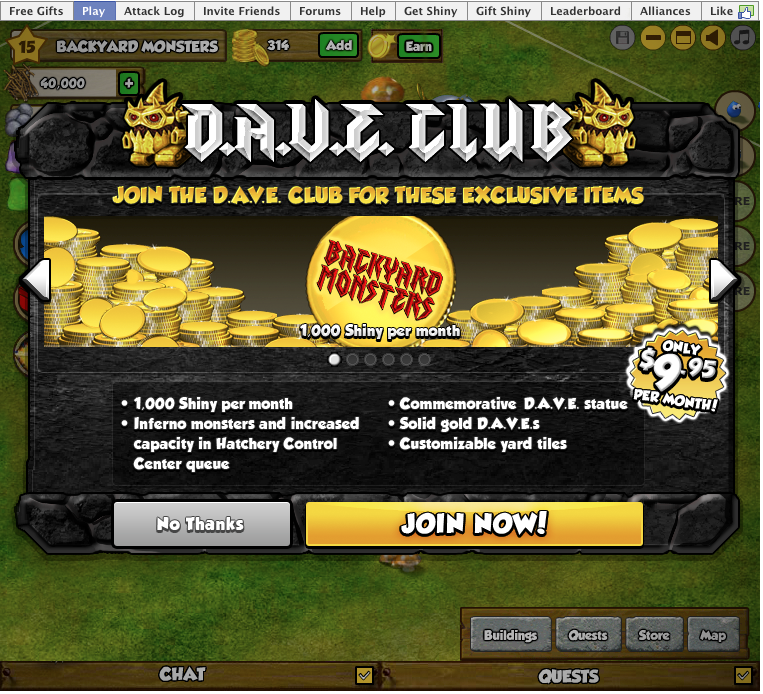 Club by Kixeye, provides both in-game currency and some unique features for $9.95 a month. "We've got people who spend money in the game, so we wanted to give them the equivalent value that they would spend plus a bunch of other unique features that they only get through the subscription," noted Getze. "It's really geared at trying to give them a benefit rather than loop in new players." Kixeye was eager to try out this new feature. "Facebook approached us about a month and a half ago to get involved with this, and we jumped at the chance," said Getze. Facebook provides complete flexibility to set the subscription price and the features, which is important to developers. The implementation of subscriptions for Kixeye will proceed at a measured pace. "Our plan is to do this with an A/B test of a very small group, and work closely with our community to see what they like. We want to make sure we're always delighting our user base," Getze explained. "If they ask for things that currently aren't in the package we'll look at adding those things. We're absolutely going to look at rolling it out to 100 percent of users and potentially to our other titles." New monetization methods in the social game space, if they work, could be of benefit to both developers and gamers. It's not clear at all what the response will be, though. "We've never done anything like this before, so we don't really know how it's going to go," said Getze. "We want our users to see it as a benefit. I really hope it increases the stickiness of the gameplay that is going on." The real test for Facebook games will come as subscriptions roll out to all developers in July. Subscriptions could be of major importance to many game developers, both by making their revenue stream more reliable and potentially by increasing the percentage of players that spend money in their games. This could be more important for a company like Zynga, which has a low rate of players that buy virtual goods, than for companies like Kixeye which have a more focused demographic that spends money on virtual goods at a much greater rate. The subscription model is a familiar one for people, and may be much more suited to the broad demographics of a FarmVille audience than the rather unusual concept of buying virtual goods. Subscriptions allow a great deal of marketing creativity to enhance the desirability of subscriptions. Developers are free to get very creative with how their subscriptions are offered, the amount of virtual goods included, and other benefits. Think of all the ways magazines try to get you to buy a subscription, and all the virtual benefits a game company could offer to get people to sign up. The impact on Zynga's revenue could be substantial, and for other developers as well. "Zynga supports any improvement to the Facebook platform and player experience that makes it easier to play and pay. We're proud of the long term partnership we have with Facebook and today's announcement doesn't change the economic relationship between the two companies. We'll be working with Facebook over the coming months as they phase out Facebook credits and will be sharing more details on this when we report our Q2 earnings, including any possible changes to our accounting going forward after the implementation of the announced changes." It just shows how fast the game industry is developing that major, seismic changes to the business model come along all the time. Could be a lifeline to Zynga if they do it right. I guess time will tell.